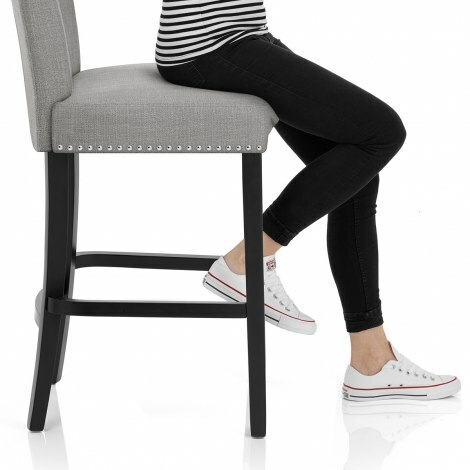 The Buckingham Bar Stool Grey Fabric is a divine design, sure to add an up-market appeal to your home or bar area. A sophisticated sight to behold, the Buckingham Bar Stool is a versatile piece that effortlessly combines modern and classic style. 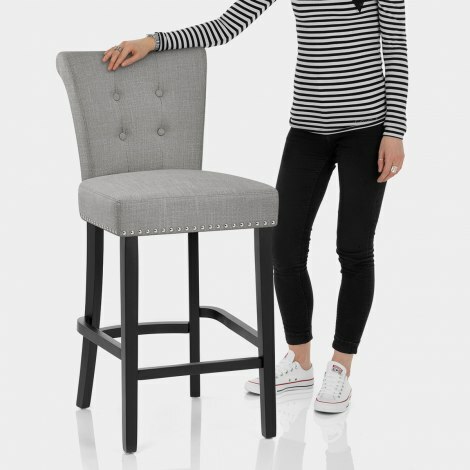 Upholstered in gorgeous grey fabric, the comfortable sprung and belted seat is also adorned with chic chrome studs. Displaying a scroll top design, the backrest offers style and support with its simple button detailing. The solid wood frame is fixed at standard kitchen height and is enhanced by a sleek black satin finish. Bracing bars strengthen the design and create a practical perch for the feet when seated. It is complete with protective plugs on the underside of each leg. "These chairs are perfect! The quality is great"
I was very pleased with the service, first class. The stools are very comfy and look great in my new kitchen. I’ve had many people mention how nice they are. I would recommend this product. Bought these for my kitchen and they look superb. Good quality chairs and comfortable. They are a bit fiddly to put together. Strong sprung seats with studded feature and high backs which are very comfortable. Fabulous looking high stool, easy to put together and very comfortable so much so we had to buy more to accommodate everyone. Great customer service. These chairs are perfect! The quality is great, and they are easy to put together. I would defineitly recommend! They are a great addition to our home.